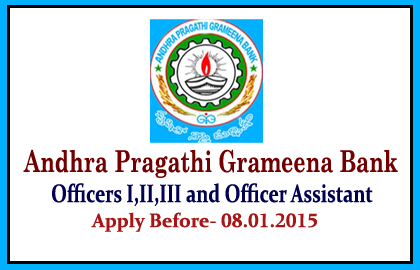 Andhra Pragathi Grameena Bank announced recruitment for the post of Officers Scale I, II, and Office Assistant (Multipurpose). Candidates those who are qualified in RRBs CWE conducted in Sep/Oct 2014 by IBPS can apply before 08.01.2015. More Details were given below. Candidates those who are qualified in the RRBs CWE-III held on Sep/Oct 2014 by IBPS can apply for these posts. Candidates can pay their exam fees through all branches of Andhra Pragathi Grameena Bank and NEFT. More details were given in the link below.